Further your organization with these colored edge sheet protectors. A super way to find things fast! Further your organization with these colored edge sheet protectors. Unique polypropylene sheet protector with a lengthwise colored edge and matching reinforcing strip helps identify sections and important parts of a presentation. Use with Sheet Protectors with Index Tabs or use them by themselves to segment ring binders by color. Insert size: 11 x 8 1/2. Assorted colors including 10 each of red, yellow, green, blue and white. 50/BX. 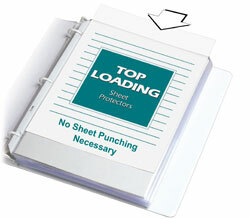 Sheet Protector Special Features: Stay organized with the colored edge sheet protectors. It ensures that documents can be stored in a standard 3-ring binder, while being easily identified with the horizontal colored edge. Suggested Use: Help identify sections and important parts of a presentation by organizing with color.